Root Canal Summary – This is an anecdotal account of my tooth and sinus experience. It is for FYI only. I make no claims or recommendations. I had a root canal for a painful tooth about 6 years ago. Afterwards all kinds of health issues started to appear in addition to ongoing sensitivity to the involved tooth. About 18 months ago nasal polyps and intense, morning only, drainage and inflammations of the sinuses started. The left nasal passage was about 60% obstructed. I opted for no surgery. Last Saturday night the tooth was more than usually uncomfortable when I went to bed. Intuitively, I did a bunch of Alastair McLoughlin’s scar moves over the gum both mesial and lingual. I woke up at 3:00 AM and my nasal passage was 100% blocked. All morning long my sinuses on that side screamed! By Sunday afternoon the nasal passage was 100% clear, drainage was gone on Monday morning, and It’s been fine ever since. I lost the link L to a You Tube interview of a cardiology professor who cited studies that revealed that 95% of root canals are infected and the same organisms found in periodontal ligament cultures are also cultured from coronary artery plaques. This makes me wonder about my development of A Fib. following the root canal? My stroke last September was from the A Fib. If any group members take on a journey in this direction, please let me know what you experience yourself or with your patients. Check with Alastair McLoughlin for his scar treatment protocol- that is what I used. I think of three things as I reflect on this experience; 1. meridians pass through the teeth, 2. 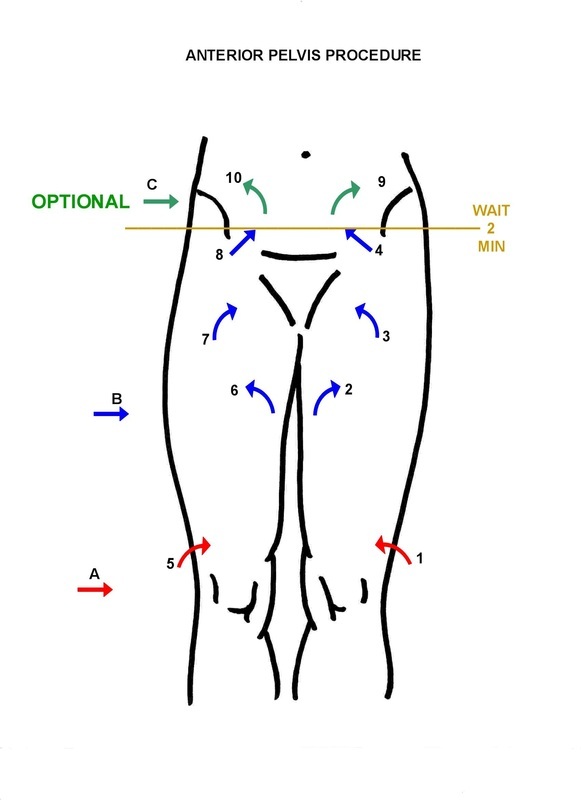 Bowen moves are vibratory and targeted over meridian points opposed to most massage strokes which are random and over vast anatomical structures, 3. And maybe there are “vibraceptors” in addition to proprioceptors, mechanoreceptors, nociceptors, stretch receptors, etc? these “Vibraceptors may what our Bowen Techinique is affecting? - ,just some rambling thoughts. If you want to chat about any of this please email me @:bowenfootdoc@gmail.com-much easier for me than FB. During my painful elbow journey the past six or so weeks, I had one very major experience. One of my patients told me about a, “Dr. Joe”. He is a foot reflexologist in Charlotte NC. Since my stomach was upset along with the elbow pain, I decided to go see Dr. Joe. The elbow is in the intestinal meridians area. I have always believed that foot reflexology and acupuncture has some bearing on health and well-being, so my mind was open. He didn’t have me fill out a form as to my medical or past medical history. Only my name rank, and serial number. He pretty much told me what I already knew regarding my health and symptom issues. Wow, did some of them hurt. Then, he said, “Okay. Chinese torture. No pain No Gain!” He ground his knuckles into the problem areas of the elbow and stomach zones. Beads of sweat came to my forehead. I couldn’t wait for him to finish his Chinese torture. I was never so relieved to be over with the session, but looked forward to going back next week for more. Why, because I intuitively knew that he had helped me. A day after the session, my patient e-mailed me to see what my experience was. I told her and she e-mailed me back. To paraphrase she said, don’t worry about what he does. He makes people well. The owner of a local professional sports team sees him regularly. His team players also get treatments. He was encouraged to fly in a private jet to the next game on the west coast so he could take care of the players. His family ties kept him from making the trip. Next week he explained to me in his best attempt to speak English how, what, and why he was doing and what he was doing. Turns out, the local doctors and their families see him. Clients who move from the Charlotte area come back to him because other reflexologists miles and miles away can’t do what Joe does. Dr. Joe can tell if you have high blood sugar. He can tell if you need a colonoscopy because of a benign or cancerous lesion. That’s why the doctors come to see him, Kind of a pre-screening procedure. Why get a colonoscopy if you don’t need it. He can tell if you have high cholesterol. My massage therapist associate reminded me of a client we were trying to help, about two years ago. He was a young man and he was in a great deal of back, neck, and other body pains. Our Bowen and massage sessions offered only minimal and temporary relief for him. A few months ago his father came back to my associate’s massage office and thanked her for all of our attempts to help his son. He had taken his son to a foot reflexologist in Charlotte who inflicted great amounts of pain whilst working on his feet. To the point that, his son had to bite on a piece of cloth in order to endure the pain during the treatment. (Sounds like the same practitioner). After a few sessions, he was totally pain free. “Different Tissues Have Different Issues” So, “Different Strokes for Different Folks”. The rest of the story. Dr. Joe studied western medicine as well as eastern medicine. Then, he learnt the unorthodox method of foot reflexology from a man in Shanghai many years ago. He puts it all together for the betterment of mankind. The patient who told me about him and her husband see him once a week. Husband no longer has gout or arthritic pain. One Monday morning, a few months following my 1st Bowen class, a patient presented with a lump the size of an almond beneath the arch on the right foot. She told me that there was no pain involved however, she was favoring it and this was causing pains in her hip and lower back. She was also concerned due to the fact that we are all suspicious when a “lump” appears. I reassured her that the lump was a classical benign plantar fibroma. Only if it grew rapidly or became painful should she consider having it removed. I informed her about the therapy that I had recently discovered and she immediately took me up on my offer. When we were all finished she arose from the table and said, “Oh my, I feel so good”. “Can I come back tomorrow for another treatment?” I told her that we should wait one week before another session and for her to make an appointment. When she returned the following week the lump had reduced to the size of a pea and she said that she couldn’t wait for another Bowen treatment. She scheduled another check on her foot and Bowen session one week later. I began the therapy prior to looking at her foot. During a point where the muscles are released on the inner thigh area ( Anterior Pelvis Procedure) she asked, “Is there any connection between that lump on my foot and my stomach?” I said, I don’t think so. Why?” She replied, “On the first visit when you released those muscles in the inner part of my thigh and left the room for me to rest, I immediately felt like a gush of worms crawling around in my stomach. All day long I had a queasy feeling in my stomach. And, when I got home from work that night my stomach and gallbladder pain completely disappeared. I have not had to take any of my stomach medications for the past 3 weeks. And, I flushed $200 worth of prescriptions down the toilet this morning. When I get to work I am calling the gastroenterologist who has been taking care of me the past 2 years and canceling my appointment for next month. I won’t need him any more”. I begged her not to mention my connection with any of this, as I do not want to be in any trouble with the medical community. She assured me that she would not and, she said, “Look at my foot”. As I looked for the lump it was almost completely gone. It was about the size of a grain of rice! I found an old foot reflexology book and opened to the foot chart. Sure enough, the lump was right in the middle of the stomach and liver zone. I told her about that and she laughed, left the office quite happily, and has never returned. Procedures performed during her sessions included low back, mid back, upper back, kidney, hamstrings, respiratories, knee, ankle pelvis, and tmj.